Keith Loehr Suicide Memorial - Suicide.org! Keith Loehr Suicide Memorial - Suicide.org! Keith Loehr Suicide Memorial - Suicide.org! Keith Loehr was a handsome, talented, popular, and intelligent young man. He loved adventures and outdoor sports more than anyone else on the planet, and he always pushed himself to the limit. 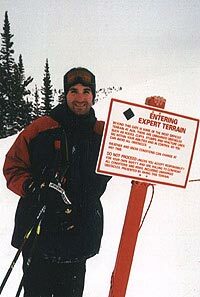 He would ski down expert ski runs when other skiers would stay in the lodge; he would skydive when other skydivers would stay on the ground; and he would scuba dive when other scuba divers would stay on the shore. He was also a tireless backpacker, and he enjoyed some wonderful backpacking trips, including a trip deep into the Grand Canyon. And he loved ice hockey, rowing, and long-distance running. All of Keith's friends knew that if they participated in a sport or activity with Keith, that they would be completely exhausted before Keith got his second wind! Keith was a great athlete. And he was an avid fisherman. He was quite skilled at fly fishing, and was able to bring in one fish after another while his friends and family looked on in amazement. Keith lived life to its fullest. And he was always looking for new challenges and adventures. So he obtained his MBA and prepared himself for new challenges in the business world. He received what seemed to be a good job, relocated, and began work. But the job turned out to be a very high-pressure job, with bosses who overloaded him and gave him assignments that he could not possibly finish. He was pushed, and pushed, and then pushed more. It was a horrible work environment. Keith did everything that he could to meet the impossible demands that were placed on his shoulders by his unrealistic, insensitive, and incompetent bosses. He worked long hours, only to come home and work some more. His days were unbelievably exhausting and stressful. Keith was a very strong person, both physically and mentally, but now he was being pushed to such an extent that he began losing sleep and losing weight. So Keith began suffering from depression, and he did all that he could to hide his depression from his friends and family because he did not want them to worry. But untreated depression is the number one cause for suicide. Six months after Keith took the high-pressure job, he died by suicide. He passed away on March 29, 1999, at the age of 29. Keith was a wonderful person.